Do you want to change your life, but just can’t find the time to get started? Are you tired of juggling multiple responsibilities, with not much to show for all your hard work? Bestselling author Doreen Virtue gives you proven psychological and spiritual solutions for making time work in your favor! 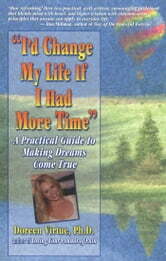 She guides you through that perplexing jungle of mind traps that cause time struggles. You’ll discover how to access more free time, streamline your schedule, and receive loving support from your friends and family. You’ll also learn methods to boost your self-confidence, reduce your fear of failure, increase your intuitive powers, and unleash your natural success consciousness. You deserve to have a rich full of fun, relaxation, prosperity, and love – starting right now!